Looking for round returns that are strong enough to be used on floor? Sand cast for style and durability, these solid bronze return air grilles have a 1/4 inch thick faceplate. 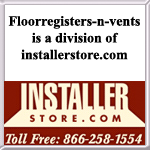 The Renaissance round vents can be installed into your floor or onto your wall. Select if screw holes are desired as well as a screen backing. This item is considered Special Order, Non-Returnable and cannot be canceled once placed. Lead time is 7 to 9 weeks. Order your round air vents in this Renaissance design and select between painted brown, white or black finish. If desired, the decorative wall grilles can also be purchased in bare aluminum and will not rust, making them great to use in bathroom installations. Made by hand here in the US. This item is considered Special Order, Non-Returnable and cannot be canceled once placed. Lead time is 7 to 9 weeks. Our decorative air returns are designed in a round shape and are available in 6 sizes. Order this white bronze vent to hide your ductwork from view and get a new spin on a timeless necessity. Made from a sand cast mold here in the US. This item is considered Special Order, Non-Returnable and cannot be canceled once placed. Lead time is 7 to 9 weeks. Hard-to-find round wall return grilles available in 18 designs and 15 decorative finishes. The custom round ceiling vent covers are available in round sizes 4, 6, 8, 10 and 12 inch. FInally! An affordable round decorative return air grille option. This item is considered Special Order, Non-Returnable and cannot be canceled once placed.